A couple of years ago while visiting New York City, Beta Wife and I stumbled on a little cheese shop in Greenwich Village called Murray's. In a few hours we were heading home to Ithaca, so we thought it wise to stock up for the trip back. Of course, this was just an excuse the buy a lot of cheese at once. Regardless of our motives, I’m glad we decided to go in. I don’t think I had ever been in a cheese shop before, I mean, not just a boutique grocer, but a store whose only wares were cheese and related products. This is where I was introduced to cheese paper, quince paste, and Époisses. But this story isn’t about the nice young fellow who handed us a sliver of stilton resting on top of a tiny bit of sweet, red paste and said, “try this.” Murray’s is like, so, 3000 miles ago. 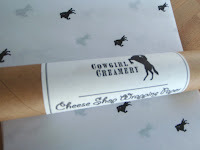 Today’s post is about the Cowgirl Creamery, now just minutes away, and their specialty cheese shop. And just for fun, how to store your cheese properly and why you should care. The Cowgirl Creamery was started in Pt. Reyes Station, CA by Sue Conely and Peggy Smith. Their business opened in 1997 and since then, their cheeses have grown quite a reputation. They use organic milk from the local dairy, Straus Family Creamery, and produce only a small assortment of cheeses. 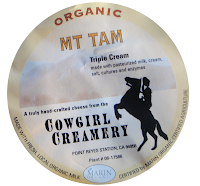 A good place to start when sampling the Cowgirl Creamery’s selection, is with the Mt Tam. It’s a soft, cow’s milk cheese with a sharp, bloomy rind, and a very mild and creamy interior. When you first take the cheese out of it’s wrapper you’ll catch a whiff of the “bloominess” that I’m talking about. Mushrooms and dirt, but with an edge. This is a cheese that's really best enjoyed at room temperature. Though this is true for cheese in general, you should especially avoid cutting corners here, because you’ll never really get to experience the flavor. The chilled rind has an unpleasant bite, and the creamy inside lacks character when you first take it out of the fridge. 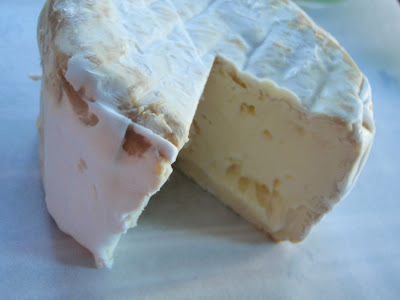 But in two hours, the rind of the Mt Tam will have softened and taken on a much milder, complex texture. The cheese will melt in your mouth. Beta Wife and I are currently divided on the rind issue—I still cut the edges off, leaving just the top and bottom, because I find the rind a bit overwhelming. The wifey loves this part, which is good because now I don’t have to feel guilty about scooping out the center for myself. What you do is a matter of personal taste, but definitely give the rind a try. The next time you find yourself near the Ferry Building, don’t resist the temptation to stop in. You know you want some cheese, and maybe a cookie from Miette, so don't try and convince me otherwise. The Cowgirl Creamery shop located in the building sells cheeses from all over the world in addition to their own, and they're just waiting to go home with you. If the store is busy, take a number to get service. The cheesemongers in their pristine white shirts will help you pick out a cheese, let you have a taste, and cut the exact amount you’d like. While you’re over there, pick up some cheese paper. Yes, I said cheese paper. It will change your life. Similar to parchment paper, it’s a lightly waxed, breathable paper that helps to prolong the flavor and shelf life of your cheeses. I also learned a new trick from the helpful experts at the Cowgirl shop: scrape your cheese before you store it. Bacteria in the cheese (this is perfectly normally, as they are necessary for cheese to exist) can lead to molding on the surface after it has been wrapped in plastic. Aftre scraping the surface, wrap your cheese in this magic paper, even put the date on it if you want, and you’re all set. And it comes in a tube and has horses on it. You can’t beat that.